After introducing KYSEK® The Ultimate Ice Chest at iCast 2015, the company continues to innovate releasing a range of high-performance products featuring the latest in cooling technology at iCast 2016. “As outdoor enthusiasts, our goal here at KYSEK is to produce innovative products that perform at the highest level,” stated Jillian Gutierrez, KYSEK® Marketing Director. After introducing KYSEK® (http://www.kysek.com) The Ultimate Ice Chest at iCast 2015, the company continues to innovate releasing a range of high-performance products featuring the latest in cooling technology. In early 2016, KYSEK unveiled its new 20 oz. Stainless Steel Tumbler. Premiering this summer at iCast 2016, the company will release four new products: the KYSEK Rover(TM) Soft Bag Ice Chest, the KYSEK Trekker Backpack Ice Chest, the KYSEK DryBag and the KYSEK Can Koozie. In addition, a KYSEK 12 oz. Stainless Steel Tumbler will be rolled out. The KYSEK Stainless Steel Tumbler (http://www.kysek.com/tumbler) was introduced in early 2016 and features new, innovative enhancements to this type of product. It offers a silicon comfort grip that makes the tumbler easier to handle, protects hands from cold or warm beverages, and prevents heat transfer to the liquid inside. In addition, the non-slip bottom protects against spills while also acting as a cushion to prevent scratching or damaging surfaces like tables, glass and furniture. A new 12 oz. Tumbler and Can Koozie product will be introduced at iCast 2016. Additional new products are being unveiled at iCast 2016. The Rover Soft Bag Ice Chest offers significant advantages to competitive products. The product is engineered to be lighter to carry, but still big enough to haul a sufficient amount of drinks, food and gear. The soft bag ice chest is also durable, leak-proof, holds ice longer and possesses all of the other high-quality features you expect from KYSEK®, makers of The Ultimate Ice Chest™. Flip Back Top: allows for easy access to your goods inside. Extra-Cushioned Strap: adds a layer of comfort making the Rover easier to carry. Rawhide Skin: high-frequency welded, virtually impenetrable, full-immersion protected...these features combine to not only make the Rover one of the most durable bags on the market, but also easy to clean. NyWeb Straps: heavy-duty straps that are designed to last. Latch Guard Buckles: snap firmly into place to keep contents secure even at maximum capacity. InternaShield Interior: flexible, lightweight, tough and waterproof. Its UV resistant properties assist in extending ice life. The Trekker Backpack Ice Chest is another KYSEK product designed and engineered to our high standards. Fitting snugly on your back, this ice chest keeps food and beverages cold when you’re on the go. The Trekker’s double-walled insulation is leak-proof, holds ice longer, and is mold and mildew resistant. The product mimics many of the Rover’s features. Wide Mouth Top: allows for easy access to your goods inside. Waterproof Zipper: Keeps melted ice water contained. Extra-Cushioned Straps: adds a layer of comfort making the Trekker easier to carry. -InternaShield Interior: flexible, lightweight, tough and waterproof. Its UV resistant properties assist in extending ice life. KYSEK DryBag helps protect gear from water, moisture, snow, sand and dirt, and is a must-have for active travelers and outdoor enthusiasts. KYSEK produces a full line of cooling technology products and accessories stemming from our KYSEK The Ultimate Ice Chest. Built upon quality engineering, design, and manufacturing, KYSEK leverages our knowledge and partnerships to provide turnkey services, delivering our products from concept to your local store. For more information on the KYSEK brand and its accessories, please visit http://www.kysek.com. 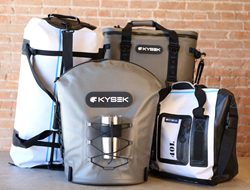 KYSEK® The Ultimate Ice ChestTM, KYSEK Rover, KYSEK Trekker, KYSEK Dry Bag, KYSEK Stainless Steel Tumbler, and KYSEK Can Koozie, are either registered trademarks or trademarks in the United States and/or other countries. The names of actual companies and products mentioned herein may be the trademarks of their respective owners.